First, stop what you are doing and go to the Brandalism website [HERE]. Once you have visited the site, come back for my thoughts on this incredible project and the implications of a larger growing social movement with an eye on our public spaces, and the health of our communities. Just yesterday, the world citizens over at the Brandalism project carried out the largest advertising takeover project ever! With 40 participating artists, they took over 365 bus shelter and freestanding advertising spaces in 10 UK cities, all over the course of 2 days. This was a massive undertaking that clearly took months of planning and the dedication of a huge number of participants, not to mention the full time work of several core organizers. The sheer scale of their action demands a conversation about who our public media infrastructure is serving and how it might be better used, a sentiment we share over here at PublicAdCampaign. Instead of repeating familiar grievances in this post, we suggest you take a look at the amazing documentation and political insights gathered on the Brandalism website so we can take this opportunity to talk about what continued large scale civil disobedience means for this growing movement. Lately, I have been amazed at the sheer number of projects and activities that are taking place around the anti-advertising movement. Brandalism in the UK and The Empty Project in Madrid continue a history of large scale civil disobedience, full scale gallery exhibitions from Vermibus, OX, BR1 and Mobstr show a growing movement of dedicated artists, activists in Australia are getting themselves arrested for a chance to challenge the status quo, urban planners in LA taking notes on how to better serve the community, undergraduate classes at our major universities are engaging the anti-advertising conversation, even our own city governments seem to be stepping up and policing our streets. All this adds up to a community trying to understand our relationship to corporate media driven public spaces, and fight for what is right. No longer does this seem like the work of a few crazy street artists. The question is what are our next steps and how do we begin to realize some of our demands in light of this growing momentum? The first step is to continue coordinated actions like the Brandalism project and any other public protests which help make this issue visible. 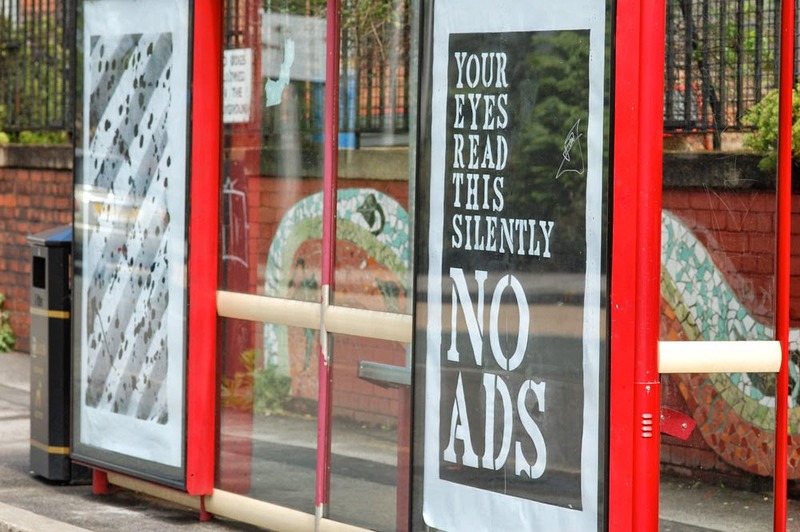 Apathy towards the negative role outdoor advertising plays in our lives, along with a long tradition of public space ownership by corporate media, has made this issue difficult for people to take seriously. It is important that we remain committed to continued disruptions so that the cause remains on the forefront of our collective conscience. The second step is using the attention these projects get to teach larger communities about issues beyond aesthetics. Advertising has a profound effect on our collective interests, it sculpts our behaviors, and thus has direct impacts on our environment as well. This issue is about understanding how the images that surround us shape who we are. It is about reclaiming control of the public spaces that define us and in the process gaining more control over the systems which govern us. The third step is to pressure our local governments to act on our behalf and impose the will of the public. Most large cities have some department which is tasked with controlling outdoor advertising. in NYC it is the Department of Buildings. These departments are highly understaffed and likely not very motivated to control advertisings persistent encroachment on our shared public spaces by what seems like an apathetic public. Email your local representatives, find out who is responsible for policing advertising, and make your presence known. The last step is to remain vigilante against false equivalencies. With a growing movement of people demanding advertising's removal from public space, outdoor advertisers will need to take drastic steps to persuade the public that they are ultimately acting in the public's interest. These will come in the form of small and large "donations" of space and random acts of altruism. There are plenty of examples of these public outreach programs masquerading as public art projects but in the end all they do is serve to concretize a public space whose visual imagery is curated by outdoor advertising corporations and the large for profit businesses that pay them to promote thier private messages.